Earlier today, Bad Omens were treated to some bad press when the Amity Affliction and Senses Fail announced that the group had cancelled a tour with them because Bad Omens' band name was too small on the poster. Now, Bad Omens have attempted to defend themselves while also making light of the situation. On their own Facebook, Bad Omens denied that they had caused "drama" with the other bands, going on to accusing them of "publicly dragging our name in the mud." They went on to say that they've since been the victims of "online bullying." We are always professional and respectful with the bands that we tour with. Anyone that's toured with us can attest to that. We are not a band that creates problems or ever finds itself involved in "drama". With that being said the last thing we wanted to do was make a big deal out of our departure from the tour with Senses Fail / Amity Affliction when announcing that we would no longer be on it. But due to both Senses Fail and The Amity Affliction's attempts to publicly drag our name in the mud along with all of the online bullying they've not only welcomed but encouraged - they've forced our hand. The terms of our deal to be the direct support act on this co-headline tour were negotiated prior to accepting the tour and they were not honored. Our team politely and professionally asked it to be honored before the tour was announced and they refused. Specific assets requested were neither sent or approved. After all of this and the tour still going live we did our best to remedy the situation to stay involved and we were met with total disrespect. At this point it was a matter of principle. We aren't going to be another young band that gets pushed around by older bands. Sorry if that doesn't work for you. This public shaming campaign the bands have created online is both ironic and symbolic to the situation, as well as confirmation we made the right choice by leaving this tour. I grew up listening to Senses Fail and I never imagined they would stimulate this kind of bullying or shaming over something so trivial - this unprofessional and ugly behavior is highly disappointing. None the less we wish the bands the best on their tour, and we apologize to anyone we've disappointed by dropping off the tour. Standing up for yourself in any type of relationship, whether business or personal, is something Bad Omens believes in. Sometimes that means people get upset, hence having to write this. 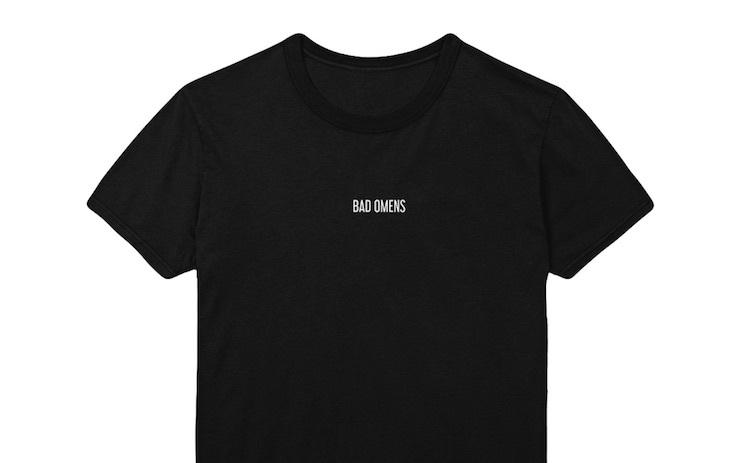 It's all pretty opaque — Bad Omens didn't really deny the small band name thing throughout their statement. They did, however, respond to that pertinent bit of information by sharing a new T-shirt that features the tiny logo from the aforementioned tour poster. The Amity Affliction and Senses Fail previously released a statement saying, "We have to let you know that Bad Omens have pulled out of this tour. They were unhappy about the size of their name on the artwork and felt the need to pull out the day after we announced."